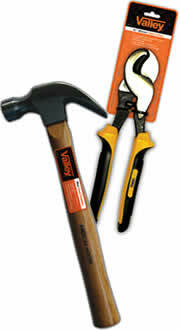 Valley Industries is a leading global supplier of a wide range of quality tools and equipment. Formed in Paramount, California over 20 years ago, we have grown to become one of North America's most prominent tooling distributors. In 2004, Valley continued our rapid growth by establishing an international distribution centre in Milton Keynes, United Kingdom. As in the North American market, the successful combination of reliable quality, fast personal service and superior value has quickly enabled Valley to become one of the fastest-growing tool distributors in the UK. For details on the Valley product range, please browse our detailed online product catalogue or contact our sales department. Copyright © Valley Industries 2008. All Rights Reserved.